Woman cannot live by sandwich and coffee alone. 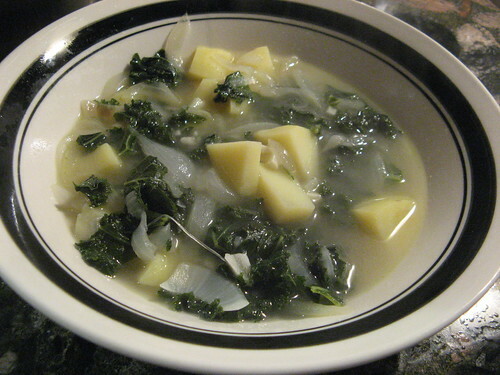 Tonight it was time for a hearty, plain soup with lots of garlic and curly green kale. Recipe is adapted from The Art of Simple Food, by Alice Waters. The recipe makes 4-6 servings (2 quarts). Remove the tough stems from the leaves of 1 bunch of kale. Wash, drain well, and coarsely chop it. Heat 1/4 cup of olive oil in a heavy soup pot. Add 2 onions, sliced very thin. Cook them over medium heat, stirring occasionally until soft, tender, and slightly browned – about 12 minutes. While the onions are cooking, peel and chop 1 pound of potatoes (Yellow Finn or Yukon Gold) into small chunks. When the onions are cooked, stir in 4 garlic cloves, chopped. Cook the garlic with the onions for a minute or two, then stir in the potatoes and kale. Add a healthy shaking or pinch of salt. Cook for 5 minutes, stirring occasionally, then add 6 cups of chicken broth. Raise the heat, bring to a boil, then immediately reduce the heat to a simmer and cook for 30 minutes or until kale and potatoes are tender. Taste the soup and add more salt if necessary. Waters suggests garnishing with a little grated parmesan. I threw in the rind of a hunk of parmesan when I added the broth to give a nutty flavor to the soup, a trick learned from making minestrone. You can, of course, easily substitute vegetable broth to make this a vegetarian soup, hence the “vegetarian” tag. White beans could supplement or replace potatoes. Carnivores, if you wanted to throw some of your leftover holiday ham in here and use the bone to flavor the broth, you would not be wrong. You could also think about browning some spicy garlic sausage or linguica and adding when you add the kale, but don’t think that you need to do that, because the soup is miraculous on its own. 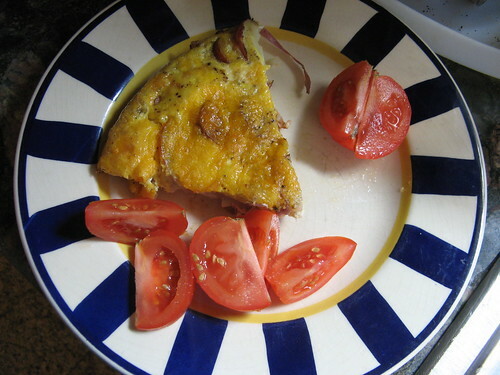 I learned how to make frittata from The Velveteen Rabbi. Her recipe involves onion, garlic, potato, chorizo or linguica, and eggs layered in a skillet and baked into an egg pie. It’s endlessly flexible based on what you have around: Spinach, feta, green onion, potato. Roasted red pepper, italian sausage, potato, onion, garlic. Sometimes I like to sprinkle the top with hot Hungarian paprika and fresh chopped flatleaf parsley. I made one today to break a streak of eating like a sad graduate student, using a sweet/spicy chicken apple sausage, tiny red potatoes, and half a yellow onion. Complete photos here, recipe after the jump.